In Jaramana on the outskirts of Damascus on 7 August, 18 civilians were blown to bits. Among the dead were children. The Russian government condemned the crime against humanity. The crime was hardly even reported in the Western press, not to mention the silence of Western governments who are supplying the terrorists with arms. Perhaps the babies murdered in the attack were supporters of Bashar al-Assad and were therefore guilty. Meanwhile in the “land of human rights”, Parisians sipped coffee reading France’s “journal sérieux” Le monde. The French daily published a story from an organization internationally recognized for its role in defending ‘human rights’: Amnesty International. Amnesty International was outraged at the violence against civilians in Syria. But there was no mention of the Jaramana massacre. Strangely, they had not heard the news. They were unaware that terrorists had planted a bomb in a crowded civilian area in Jaramana murdering civilians. Instead, the Le Monde article quoted statements made by Donatela Rovera, an Amnesty activist who had spent some time with similar groups to those who had planted the Jaramana bomb. Rovera was outraged at the Syrian army’s determination to defeat the terrorists. “The regime is using banned weapons” she said. In Rovera’s twisted view, banned weapons would not include car bombs planted in crowded market squares. Banned weapons are the weapons that all national armies fighting to defend their nations use, such as ballistic missiles. Amnesty’s human rights militant doesn’t elaborate on just what that viewpoint is. She makes no mention that her beloved rebels are forcing women in occupied Aleppo to wear the burka, nor does she mention the fact that they are using food as a weapon against the people in an attempt to starve them into submission. No, the message is clear, the rebels are the good guys, although there are some rogues among them. Is it not astonishing that a government that AIMS to kill as many as possible of its own people, a tyrannical monster that sadistically massacres scores of its own citizens day after day, could manage to stay in power, in spite of the fact that so many of those citizens support the heroic car bombers attacking that government, support the head-hackers opposing that government, cheer on the child soldiers wielding guns they can barely lift against that government, and that such a “popular uprising” could have the full logistical, propaganda, and military support of the most powerful nation the world has ever known, and still after two-and-a-half years of head hacking, cannibalism, and murdering mayhem, the Al-Qaeda “rebels” still can’t bring the “revolution” to a close? For Amnesty International, the small babies in the Jaramana rubble are obviously “government forces”. If the opinion of Amnesty International were to the contrary, they would have published condemnations of such crimes. They didn’t and are therefore complicit in these crimes. This is what Amnesty International has been doing now for many years and since the start of this war against the Syrian people, Amnesty has been unwaveringly on the side of the aggressors. Their reports of the war have all been based on “activists say” and “according to activists”, “human rights militants” and yet they have condemned the Syrian government on the basis of all these wholly unsubstantiated claims by their so-called “reliable” sources, who have been caught committing crimes and blaming them on the government since unknown snipers opened fire on protestors and police in the town of Deraa in March 17, 2011. 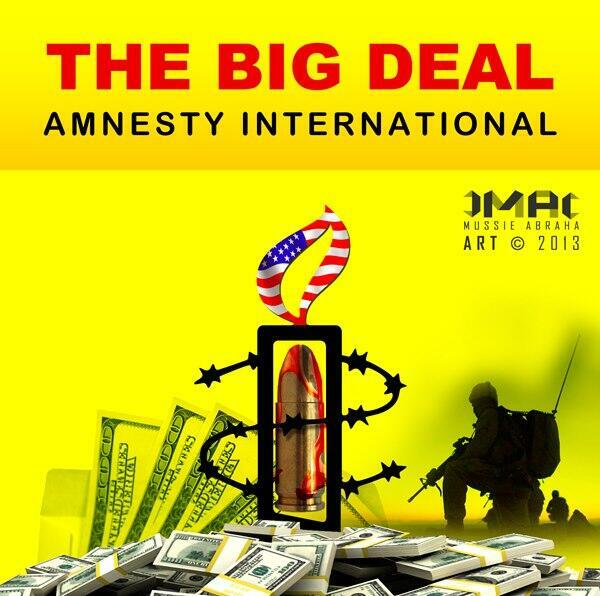 Amnesty International is a war propaganda organization for imperialism. In fact, the majority of the most highly publicized human rights organisations in the West function as ideological indoctrination agencies for neo-colonialism and imperialism. In this respect, they have replaced the Christian missionaries of the 19th century who provided the justification for colonial subjugation on the pretext of spreading “Christian civilization”. Christian value-spreading colonialism has been superseded by human rights promotion. During the terrorist campaign led by the CIA’s Mujahedeen against the Democratic Republic of Afghanistan during the 1980s, Amnesty International published a report condemning alleged torture and human rights abuse against the Mujahedeen terrorists by the Afghan government, while ignoring the car bombings and atrocities against civilians being committed by Bin Laden and his hoards of drug-dealing thugs, racists, and misogynists. The mastermind of the ‘Afghan Trap’, designed to provoke a Soviet intervention in Afghanistan, was US National Security Advisor Zbigniew Brzezinski. He is also a former director of Amnesty International. The current director of Amnesty International’s American section is Suzanne Nossel, former US State Department Assistant Secretary for International Organizations. It is time to question not only Amnesty International but the entire ideology of human rights. French philosopher Michel Foucault argued that man as an ‘empirico-transcendental doublet’ was essentially an invention of the 18th century, arguing that the notion of individuality conceived as transcendental ego separable from social and historical forces, first appears in Western philosophy during the Enlightenment. Foucault celebrated the “death of man” as human beings began to be conceptualized by structuralists and post-structuralists as decentered points in a vast matrix of power relations, a vision which ultimately deprived the human being of agency. The political consequence of this profoundly Nietzschean conception of man is relativism, nihilism and petty-bourgeois, reactionary leftism, which opposes everything and defends nothing. However, in spite of their rejection of man post-structuralists and postmodernists still defend human rights. Marxists also reject the notion of human rights due to the fact that it represents a bourgeois conception of the human being. For Marxists, human rights are bourgeois categories that correspond to bourgeois class interests. Many left-wing activists defend the notion of human rights. There are others, however, who contend that the concept of human rights should be critiqued and rejected; human beings as social entities are what we should be defending; human beings as socially and historically constituted actors, shaped by their environment but also capable of shaping and overcoming that environment; complex social, dialectical beings not abstract egos with rights. It should not surprise us that human rights agencies would function as the propaganda departments of imperialism. The concept of the rights of man was born with the historical rise of the bourgeoisie and the capitalist mode of production. Therefore, human rights go hand in hand with the rights of property. Human rights are always property rights; the rights of exploiters; the rights of oppressors, of the terrorists. Instead, we need to defend social rights. Man, as Aristotle argued, is a political animal, that is to say, an animal whose being is inseparable from the polis, the social fabric, the community. Amnesty International, Human Rights Watch and similar rights-based organizations are the call girls and rent boys of a new type of hyper-individualist imperialism that is threatening the future of human beings’ ability to empathize with the suffering of others. Human rights groups are more interested in “rights” than humans, with titles and deeds than emotions and passions, with being on the “right” side of political correctness than being truthful and honest; with the liberty of the market than the liberty of the human being. Peace activists should not only denounce, expose, and condemn their lies and manipulation but the very philosophy of human rights itself; for human beings cannot be conceptualized as entities born with inalienable rights but rather as social beings growing and evolving in dynamic communities that impose ineluctable duties, debts and obligations upon them towards their fellow toilers and labourers. Without such complex relations of interdependence there would be no society and consequently no human beings. We should reject abstract human rights and proclaim concrete social rights; rights to free housing; the right to democratic ownership of means of production; the right to live in peace; the right to a job; the right to privacy; the right to free education, transport and health care; the right to healthy food and water; the right to freedom of expression. We should not forget that most, if not all, the unspeakable crimes of this war have been committed by the so-called rebels. We should not forget the massacres of Houla, Banias, Hatleh, Aleppo University, among countless others less known, less publicized; and now the massacre of Jaramana. Amnesty International, Human Rights Watch and others, have been complicit in covering up these crimes. They should be held to account. It is not because Amnesty International is a phony human rights organization that it is complicit in the war crimes being committed against the Syrian people; rather, Amnesty’s war propaganda on behalf of imperialism is simply a corollary of the bourgeois ideology adhered to by all human rights groups. The current “humanitarian” wars so zealously defended by human rights fanatics are symptomatic of a deep crisis of civilization. In the 1960s, France’s Maoist film director Jean-Luc Godard attempted to show in his nightmarishly prescient film Le Weekend how French bourgeois ideology would turn civilized humans into blood-thirsty cannibals. This author has heard numerous commentaries in the French and international press playing down and explaining the cannibalism of some of the Syrian terrorists as a reaction to the unfathomable “brutality” of the “regime”. Cannibals and psychopaths have been converted into Montaigne’s noble savages. This is the ideology of a decadent consumer society where certain atavistic tendencies of hunter-gatherism are re-emerging in the chaos caused by the slow death of technocratic capitalism. We must document crimes such as the massacre of Jaramana and expose those who attempt to cover for their perpetrators, not because they are violations of human rights but because they are violations of humanity and the social networks that sustain meaningful human relations. We must stand up for the human being and consign human rights to the dustbin of history.